Distinction Gallery has made waves at its first appearance at the LA Art Show. The curation of their booth and choice of artists have art fair visitors talking. 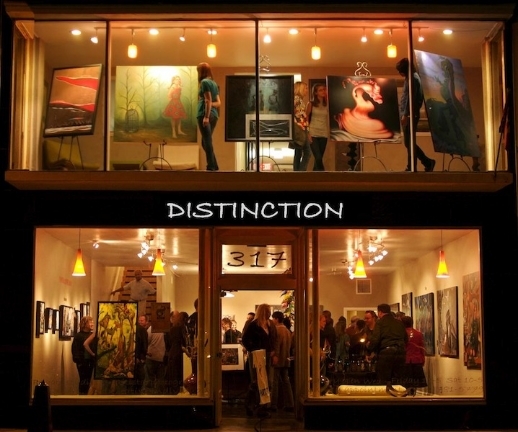 Established in 2004,Distinction Gallery represents a variety of artists from different career stages (Emerging, mid-career and veteran professional artists). At the LA Art Show 2016, Distinction Gallery is presenting a body of work which is a mixture of surrealism, pop and modern portraiture. Continuing our spotlight on Distinction Gallery, ArtCrasher is highlighting 3 more artists whose work is on display at Distinction Gallery's booth (635) at the fair. "Kari-Lise Alexander's expressive work explores themes rooted in her Scandinavian heritage. Innocent maidens float in worlds of their own making, oftentimes losing themselves in their daydreams. At a young age Kari-Lise was always experimenting with paints, pencils, pastels and anything else she could get her hands on. In 2000 she studied fine art for two semesters but left college to pursue other interests. It wasn't until spring of 2009 that her heart led her back to painting and she hasn't stopped since. Working from her home studio in Seattle, Kari-Lise creates paintings that captivate the viewer. Her work often reflects the Norwegian folk art of rosemaling. This traditional art is given a contemporary feel in many of Kari-Lise's paintings as it wraps and entwines itself within the composition, sometimes floating as a ghost as if it were an ancestral reminder." "Born in Southern California, Casey Weldon spent the majority of his formative years there graduating from the Art Center College of Design in Pasadena. After operating a studio out of Las Vegas, Weldon relocated to New York, then California, and now Portland where he works as a full time artist. His fine art, imbued with a sumptuous illustrative quality, is indicative of his profession. Weldon mixes iconography of today and the past to evoke a sense of humor, nostalgia, fantasy and even melancholy within the viewer. His pallet and haunting subjects recall the Surrealist masters like Breton and de Chirico." "After a Baccalaureate in Fine Arts and an Interior Designer Degree from ESAG Penninghen in Paris in 1998, my first contract was with an advertising agency to give Malboro Classics flagship stores a total makeover...I rapidly realized that no place was left for what is the most important to me: creativity, imagination and personal accomplishment. It suddenly clicked. My daughter inspires me and let me spread my wings: going back to childhood was obvious.Thus in 2006, I swapped my architectural plans to let my paintbrushes express themselves again and to allow my imagination to have free play." To learn more about Distinction Gallery and the artists it represents,you can check out its website, Twitter,Facebook and Instagram. 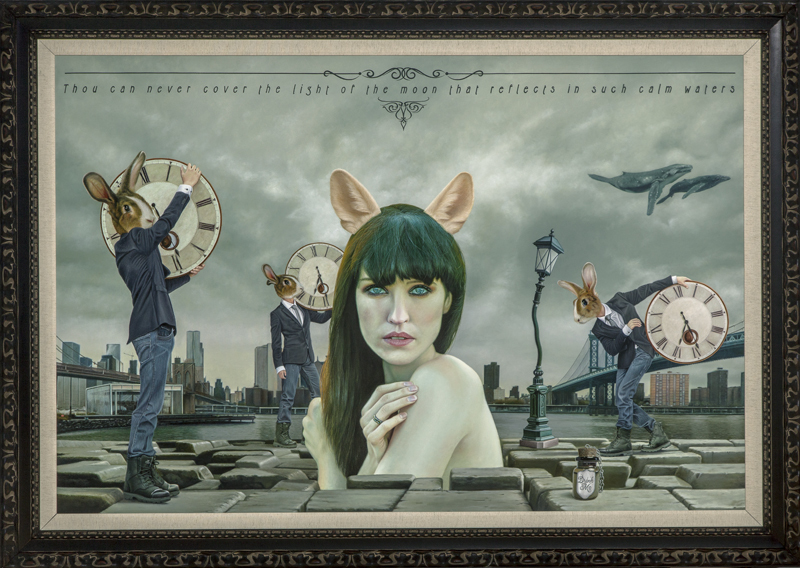 Making its first appearance at the LA Art Show,Distinction Gallery has arrived in Los Angeles to present a stunning body of artwork that is a mixture of surrealism, pop and modern portraiture. Established in 2004, Distinction Gallery is a venue whose portfolio can satisfy the eye of any art lover. By representing a variety of artists from different career stages (Emerging, mid-career and veteran professional artists),Distinction Gallery is able to provide a range of art mediums to viewers. What the gallery has done at the LA Art Show this year is prove why it can become a staple at this art fair. It has demonstrated that a gallery can display a number of pieces consisting of different mediums that are complimentary of each other. Each art piece is uniquely individual, but collectively this body of art illustrates the strong curation of this gallery. As CEO and founder Melissa Walker shares "We strive to find artists who truly standout, not only in their refined craft, but also with their materials and subject matter". Distinction Gallery will be at the LA Art Show from January 27-31 at booth 635. To learn more about Distinction Gallery and the artists it represents, you can check out their website, Twitter, Facebook and Instagram. "Jon Jaylo's artworks play around a parallel dream world in where everything is floating surreal and dancing in a contained universe inspired by poetry. His technical depictions are often varying in display and style, as if he himself is never content with the present stature of his works. They are constantly evolving in both idea and form, gradually maturing together with the artist himself. Scaling this balance, narrating a massively deep philosophy of thought through a theatrical rendition of intensely brilliant colors that seem to amuse its audience and present a status of intellectual complacency." "My art is a narrative, visual poetry, making a social statement to move the viewer to action or realization. An important part of my work focuses on the street, the place where people live their daily lives. This allows me to interact with an audience on their own turf and observe how they react to the art; it is a social experiment. These open-air installations focus on the ephemeral state of street people and enable the viewer to participate in the outcome of the pieces, whether the viewer leaves or saves them from the street." "The women who populate Scott Rohlfs' acrylic paintings are a fusion of the artist's personal experiences and influences. His women exist in a realm of moody atmospheres, tattoo-inspired couture and pop cultural elements. Rohlfs combines classic realism with an element of distortion when painting, resulting in surreal imagery. The eyes of his subjects are often the focal points of his work, imbued with an arresting quality."